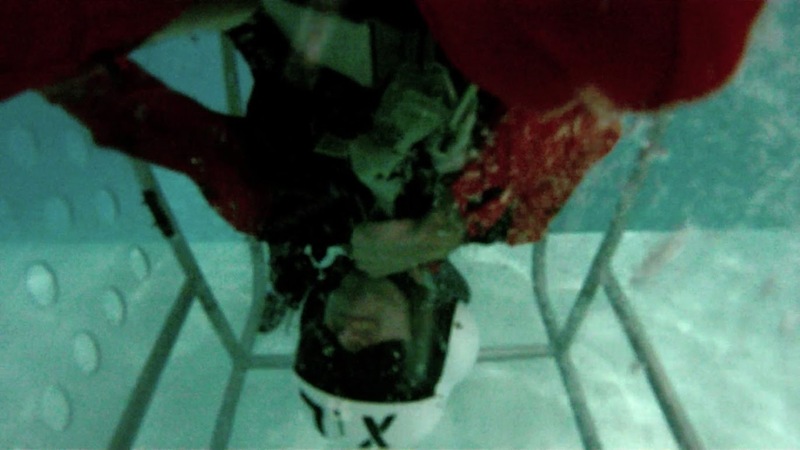 After half a day of classroom instruction on emergency preparation, we practiced inversion dunking in the Shallow Water Egress Trainer (SWET). While this may seem like some type of waterboarding torture device, the SWET is actually a very important trainer for helping one confront the fear of drowning in order to remain calm and safely egress a submerged aircraft. I learned that I can experience quite a lot of anxiety before being dunked upside down underwater, so this training was important for me to learn how to manage that apprehension so I could get myself to safety. After strapping into the seat, assuming a brace position, and holding your breath, you are inverted underwater. Immediately, the water rushes up your nose where it floods your sinuses and burns tremendously. However, that discomfort is the least of your worries. You have to remain calm, orient yourself in space using touch, find an exit (or make one), release your safety harness, and swim to safety - all while keeping your eyes closed and never letting go of your reference points. Having gained confidence in the skills we learned in the SWET, my A4H teammates and I then moved on to the Modular Egress Training Simulator (METS). The METS is an aircraft mockup that can be configured to represent a wide variety of vehicles. 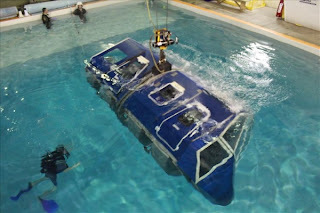 It is attached to an industrial crane that lowers rotates the METS to simulate the rapid sinking and inversion experienced during water landings. For our training, the METS was set up as a Black Hawk helicopter since no spacecraft configurations exist yet for it. Just like in the SWET, you first strap yourself in and assume the proper brace position. 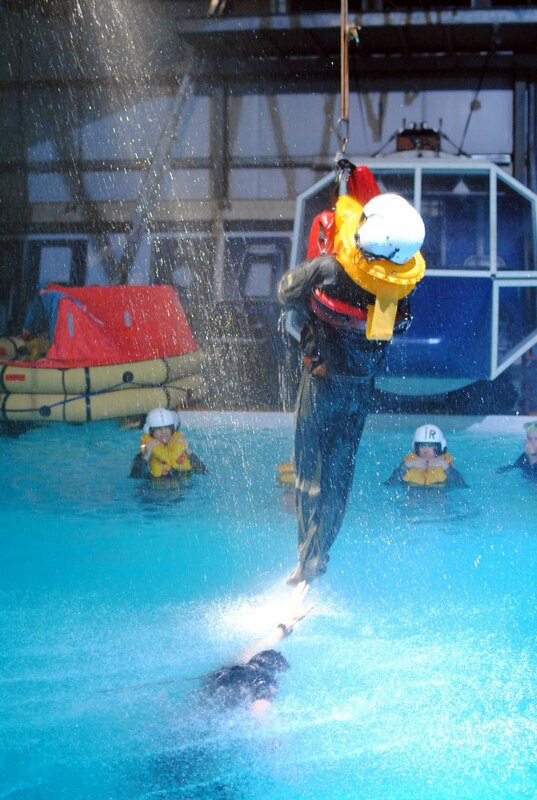 The METS is lowered to the water while an instructor yells "Ditching, Ditching, Ditching!" Water quickly fills the cabin starting with you feet. By the time the water reaches your waist, the METS starts to rotate until it is completely inverted and submerged. Holding a breadth, you have to calmly reach for an exit, push out or open the exit hatch, unbuckle your harness, and pull yourself outside the vehicle. It's challenging, but it's rewarding when you learn the proper procedure and execute it correctly. A number of expert Survival Systems USA divers and instructors watched us closely to ensure our safety throughout the process. 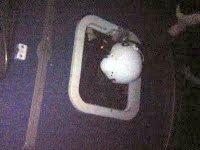 Through many iterations, we eased into increasingly realistic scenarios with more restrictions imposed on us like having to egress across the cabin instead of at the nearest exit or having to wait for other crewmembers to exit before egressing yourself. We sat in different seats with different harness types and brace positions too. By the end of the day, we were doing simulations in the dark with simulated rain, wind, and sound effects to make the experience as realistic and disorienting as possible. On our second day of dunker training we spent the morning in the classroom learning more about aircraft ditching scenarios and how one's chances of survival are dramatically higher if an emergency air supply is available. That afternoon, we mastered the use of the SEA MK 2 Emergency Breathing System (EBS), also known as the HEEDS. This small air bottle contains compressed air and a mouthpiece regulator that allow you to breathe underwater for a few minutes. It is commonly used by military flight crews, firefighters, and search & rescue teams. Astronauts on the Space Shuttle also had EBS bottles available. Having the EBS makes the egress training so much better! Rather than relying on only your breath hold for about 30 seconds of air, you enjoy the luxury of time, which makes it easier to maintain calm as you methodically go through the egress steps. We duplicated our training runs from day 1 in the SWET and METS with the addition of having the EBS air supply. By the end of the day, my confidence had grown very high thanks to the EBS, and I was really enjoying the METS runs. 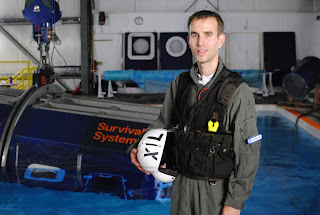 After egresses from a ditched aircraft or spacecraft, one must then know how to survive at sea to maximize chances of rescue. 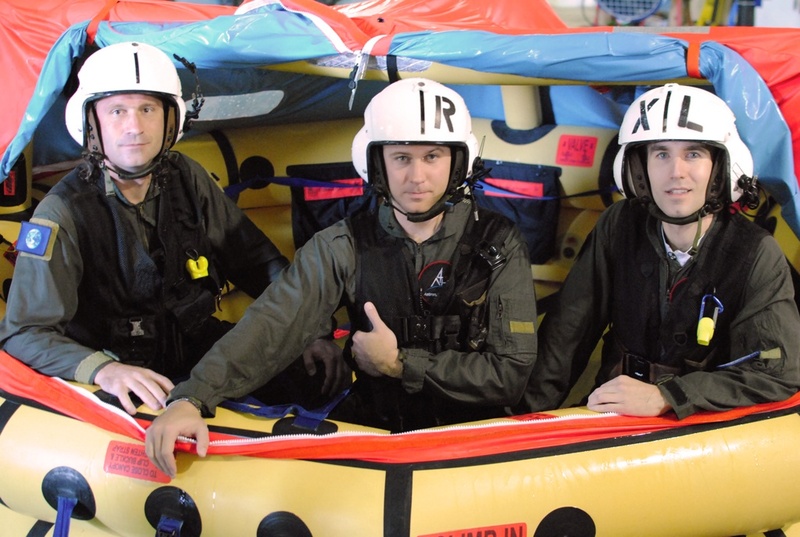 We practiced jumping from a 30-foot high platform, inflating our life vests, and attaching ourselves to a helicopter rescue basket and strop hoist to simulate evacuation from and rescue by a hovering helicopter. 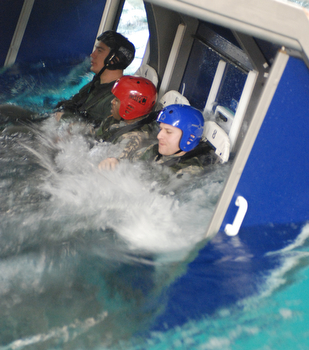 With the simulated hurricane force rain, wind, and sound effects, I felt like I was in a commercial for the Marines. For the full impact, checkout the video highlights. 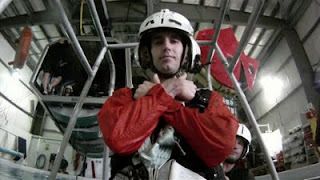 Next we practiced dry evacuations from the ditched aircraft in which the entire crew had to egress into a life raft. 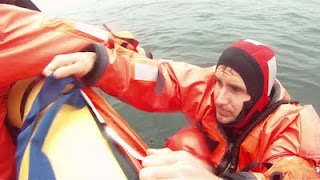 We saved the wet evacuations into the life raft for the next day when we went to sea. The whole A4H flight member crew is shown posing in the raft below. After surviving the landing incident itself, one must endure at sea until rescue arrives. That was the focus of our third day of training. We spent the morning learning about the effects of and countermeasures for hypothermia, sea sickness, dehydration, and mental stress brought about by survival stuations. Then, after practicing some group formations and donning our immersion suits, we went out to sea and put our skills to the test. Here is a great photo of us looking very astronaut-esque in our orange suits before we embarked. 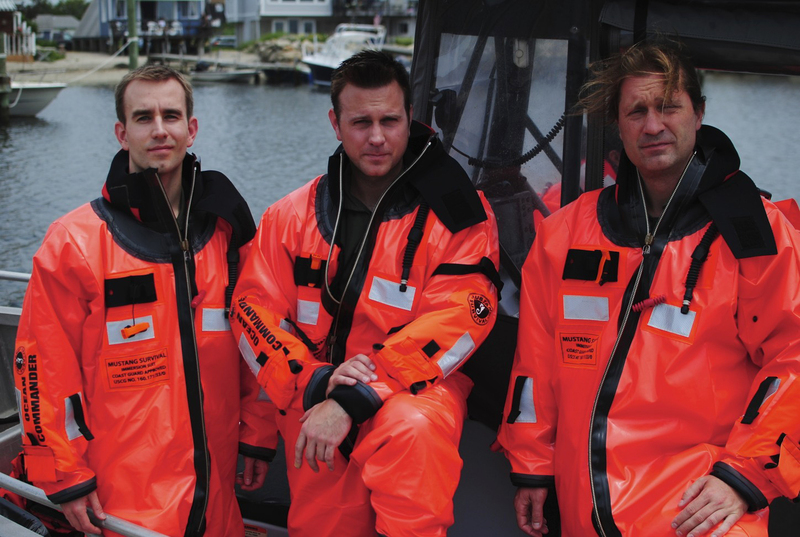 Sea survival is very much about working effectively as a team, and that's just what we did. We abandoned our vessel to find ourselves floating in the vast expanse of the Atlantic Ocean with no land in sight (It was a very foggy day.). Then, we linked up in the chain formation so we could remain together and efficiently travel across the water to the life raft (which had been dropped overboard a distance from us by the boat captain). 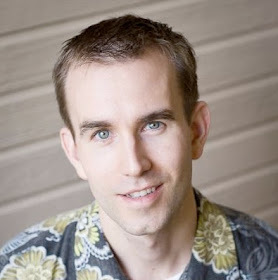 Check out the great video clip showing us coordinating our movement in the chain formation. We also practiced the carpet formation, which is useful for preserving energy and supporting injured crewmembers. Upon finding the floating raft container, we pulled the cord to deploy and inflate the raft. We took turns climbing in a few times with varying techniques (unassisted, assisted, injured). We also performed a mock rescue of an unconscious floating crewmember. The four phases of sea survival with a life raft include protection, first aid, signaling, and endurance. In the protected environment of the life raft, we first saw to any injuries or illnesses and then took stock of our supplies. Then, we signaled for help using three different flares: smoke, rocket, and magnesium (Actually, we deployed them from the boat earlier for safety purposes.). Finally, we had to make ourselves comfortable for the long run. That meant bailing out excess water, taking seasickness pills if necessary, rationing our food and water, and finding ways to pass the time. 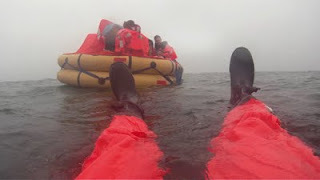 We only spent a couple of hours bobbing in our raft at sea, but it was a sufficient introduction to what it would be like in a real situation. Having successfully graduated from the intensive Survival Systems training, we next decided to unwind by going for a fun SCUBA dive as a team building activity. 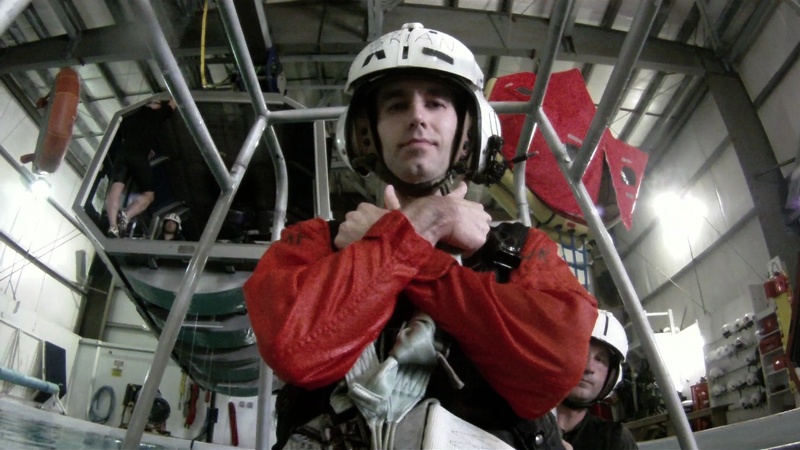 SCUBA training provides good situational awareness in three dimensions in a hostile environment that closely resembles the microgravity of space. It is one component of our training, so the activity also served as a good refresher on those skills. 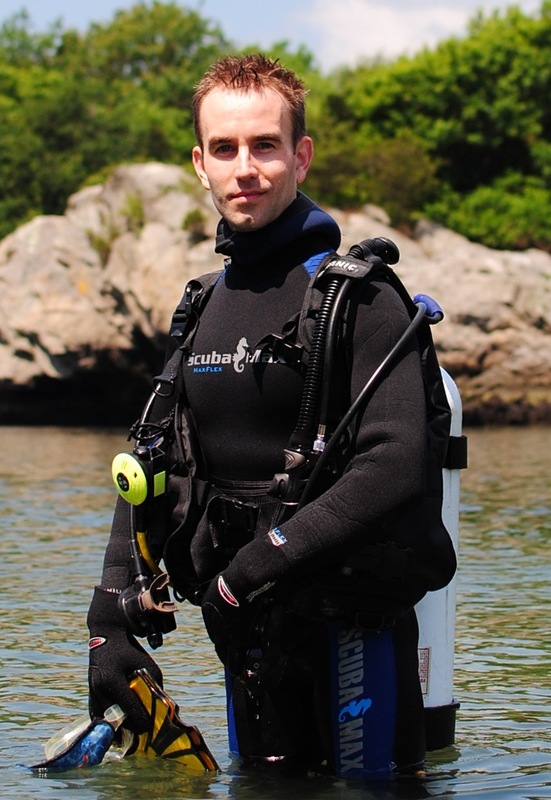 This was my first time to dive in the Atlantic Ocean in "cold" water, and the thick 7mm full body wetsuit protected me just fine. We embarked on the shore dive from a picturesque cove in Fort Wetherill State Park near Jamestown, Rhode Island. Although visibility was poor due to a storm the night before, we were able to see crabs, lobsters, anemone, jellyfish, flounder, and a few other fish. The conditions also meant we had to practice extra care with navigating and maintaining formation as a group. Special thanks to Seaview Scuba for taking us on the excursion.